You’ve got an idea, a product or service with a difference. You know that there are people out there who will buy it. Do you recognize this? Are you one of these people? However, although these are the primary components for starting up in business and they form the basis of a new business formula upon which a successful business can be built, this is by no means a complete recipe. On top of these basic requirements, you may have a business studies degree or similar from a top class business school. Or you may have worked for a large organization and got the chance to observe the many facets of the corporate world. Or you may even have been born into a family of successful business people and you helped out in the family business during the school holidays. Or maybe you’ve experienced all three! These background experiences are all valuable in steering you in the right direction, but they don’t make you a self employed success story. And this is where Wellbusiness comes in… we can help you turn your business idea into a commercial reality. That’s because we understand the dynamics and the formulas that make small businesses work, and from small ideas we can help you to transform your passion into a potential winning formula. For any business to get off the ground and keep going, the foundations have to be sound and the overall proposition strong. As well as an idea, product or service with a potential market, there must be a determined and well planned execution. And this involves having every angle of running a business covered. You might be a brilliantly creative person with lots of exciting ideas to share, but you fall short on knowing how best to implement them. Or you may have good planning and organizational skills but lack inspiration for new and better ways of doing things. And in most small businesses, by their very nature of being small, you are the ‘owner-operator’ whose main objective is to simply keep the cogs turning. This is so prevalent in fledgling businesses where it’s a case of ‘all hands on deck’ with no time for working ‘on’ the business as well as in it, and it becomes increasingly difficult to see above the parapet. We at Wellbusiness know very well what its like to face the challenges of setting up in business, because we’ve been there a number of times. And it doesn’t matter what line of business you are planning to enter, the basic principals and corresponding tasks are the same. It’s well known that there is a fine line between success and failure in business. And all too often, which side of that line you land on depends heavily on the degree of thoroughness and completeness that your business model demonstrates. In the early stages, you don’t normally have a full complement of people in your organization to help you build and maintain a comprehensive and detailed plan of action, and that’s when you can benefit with help from outside your business, especially from people who have been in similar situations and whose hearts pump with the same entrepreneurial blood as you. 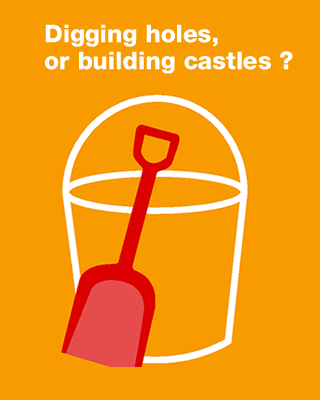 When you’re running a business sometimes it’s difficult to tell whether you’re digging a hole or building that castle. Many small business owners who want to advance to the next level can so easily be blind to the many opportunities for growth because they are ‘at the coalface’ day in, day out. There is never any time to step outside operations, to analyze the business and to focus on the strategy for the future. And if you ever do get the time to extract yourself from your daily chores to work ‘on’ your business instead of in it, often the outcome generates feelings of frustration and disappointment. You do lots of brainstorming and maybe even create a lengthy action list, but alas, nothing gets done and you’re back to the grindstone once again! Or you might be one of those business owners who are in denial of the need for change in order to grow or even just keep your head above water. You feel comfortable with how things are, and you’re satisfied with how your business is doing. What’s happening here is that your passion is being drowned and your energy is being sapped by contentedness and complacency. Your chances of taking the business to the next level are seriously diminished and you are becoming a ’busy fool'. Okay, that’s not you, we know that…You do recognize the need for change but you don’t know how you can possibly achieve it. You’ve surrounded yourself with a team of ‘worker bees’ who are hopefully doing a good job on the ‘shopfloor’, but somehow you still feel isolated, vulnerable and unchallenged. Wellbusiness can be that missing link, giving you the help and support you need to realize the opportunities for change and growth in your business.